When you compare AncestryDNA and 23andMe you will find that the companies are both excellent at what they do. However, they provide slightly different services which are marketed to different types of users. Ancestry focuses on genealogy testing and analysis, which a whole suite of tools for building and researching your family tree. 23andMe combines a simpler version of ancestry testing with genetic health testing to provide a larger set of information from your genetic material. Both companies excel in certain areas, while both companies also have weaknesses. Check out the executive summary of this Ancestry vs. 23andMe comparison here, or read the whole thing below! Conclusion: Both companies offer a variety of unique services, and are filling different market niches. Ancestry is a great choice for genealogy research, while 23andMe will give you good look into genetic traits which may influence your health, as well as providing some information on ancestry. Availability Most countries United States, United Kingdom, Ireland, Australia, New Zealand, Canada, and 29 more countries. Special Features Ancestral analysis, Neanderthal ancestry Compare ancestry origins between family matches. Platform automatically identifies common ancestors, surnames and birth records based on your matched family trees. 23andMe represents a much newer company than Ancestry, but only because Ancestry has been involved in genealogy long before the days of genetic testing. If you compare AncestryDNA and 23andMe in terms of their company background, Ancestry seems to hold the advantage. Ancestry has been in the business of genealogy for decades and has over 10 million users of their DNA test service since 2012. By comparison, 23andMe has only been around since 2009 and has only 5 million users. However, 23andMe is growing rapidly and is backed by industry giants such as Johnson & Johnson and Google Ventures so they may eventually gain the advantage. Winner: Ancestry, with a larger user base and longer time in business, has a slight advantage over 23andMe. Ancestry offers a single DNA test kit, which is one of the most advanced on the market for ancestry DNA testing. When you compare AncestryDNA vs 23andMe and look at the ancestry testing portion, Ancestry is far ahead of 23andMe. Ancestry offers a much more detailed look at your family history. Their platform also offers advanced family matching and family tree services. This gives users access to their extensive database of historical records. With these records, a person could easily confirm certain aspects of their family history, far beyond what other companies offer. 23andMe takes another approach at DNA testing, focusing more on the DNA evidence and less on external records and other users’ information. 23andMe offers two main DNA test services, one for ancestry only, and one for ancestry and health-related genetic testing. The company tests many aspects of your family history, including maternal and paternal haplotype analysis. This can give you insights into how your oldest ancestors migrated out of Africa. The health service includes genetic analysis of different genetically-influenced traits related to health outcomes. For the ancestry only service, 23andMe charges $99. For the health and ancestry package, they charge $199. When you compare AncestryDNA and 23andMe in terms of their offerings, it is clear that the two companies set out to accomplish different purposes. Ancestry is a company built around helping people explore their family history. 23andMe is a newer company with the sole purpose of providing direct-to-consumer genetic tests. Within this category, the winner is partially determined by what you are looking for. If you want to build a family tree, 23andMe does not offer those services and is not the right choice for you. If you want to know about traits related to health, you won’t select Ancestry because they don’t offer those services. In general, most people who are interested more in genetics than their family tree will enjoy 23andMe’s offerings more than Ancestry. Further, to use most of Ancestry’s advanced family tree features you have to pay a subscription. These subscriptions can get expensive, and add a significant hidden cost to the results. When you compare AncestryDNA and 23andMe in this regard, 23andMe is the clear winner. 23andMe offers health and ancestry testing, is currently the only company with FDA approved cancer-screening tests, and has no hidden fees beyond the purchase of a test. Winner: 23andMe, because they offer multiple genetic tests and has a pricing scheme with no hidden fees or necessary subscriptions. However, if you want to build a family tree that can incorporate your DNA results, Ancestry is the only choice. Both companies claim that their results will come within 6-8 weeks after the laboratory receives your DNA sample. Both companies also have an online platform to review your results, available in a number of different reports. 23andMe offers a wider range of tests about your health results, which will also be available through the online platform. A major difference between Ancestry and 23andMe comes in what you can do with the results. With Ancestry, the platform can also be used to build family trees and research actual documents your family may be recorded on. But, for these deeper research capabilities, you must also pay a subscription fee. When you compare AncestryDNA and 23andMe in terms of results, it is largely a draw and based on what information you are looking for. Winner: Draw! Though 23andMe offers a wide variety of results on their online platform, Ancestry has much more specific information for those researching their family history. In terms of data privacy, both companies say in their Privacy Policies that data will be aggregated and researched. This means that your personal information will be removed, and the genetic data will be analyzed by researchers to gain a greater understanding of human genetics. 23andMe aggregates the data and sells into a large number of third-parties, such as universities and pharmaceutical companies. Ancestry aggregates the data as well, but it seems that it is used largely by their own researchers to better understand human genetic relationships and improve their own service. Winner: Ancestry. Unlike 23andMe, your genetic data is only used for historical research, not sold to other companies. Both companies have seen their fair share of both positive and negative news coverage. 23andMe made headlines as the first company to receive FDA approval on their cancer-gene screening tests. Ancestry has been covered extensively as one of the foremost genealogy sites. Both companies have seen criticisms from unhappy customers questioning the validity of their tests, as well as stories documenting the successes and triumphs of their tests. Winner: Draw! Both companies have an average of 4 of 5 stars, over thousands of reviews. Deciding an overall winner when you compare AncestryDNA and 23andMe really comes down to what you are looking for. If you want to explore all the aspects of what your genetics can tell you, 23andMe is a better choice. If you want to focus on what your genetics can tell you about your family history and geographical heritage, Ancestry is a more powerful tool. Both companies have good user reviews, mostly positive media coverage, and professional results delivered via an online platform. Both companies used advanced genetic testing techniques, though they are looking at different parts of the DNA and conducting different analyses. Winner: Draw! 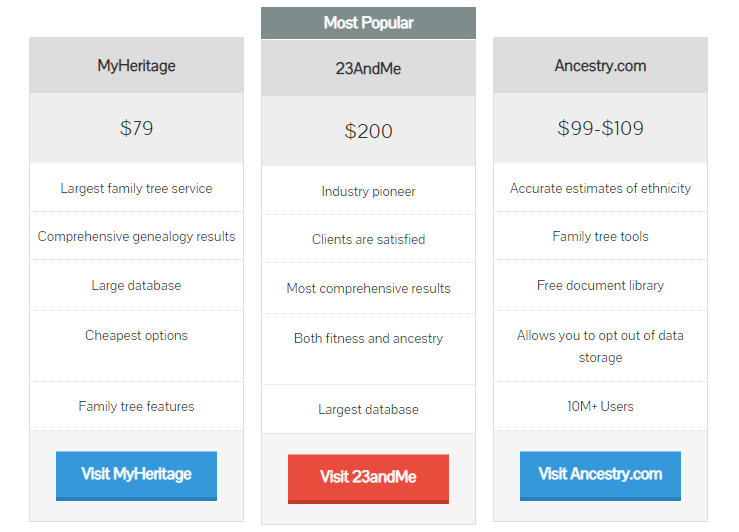 Both Ancestry and 23andMe are advanced platforms, which give the end user the results advertised. 23andMe may gain the future advantage, as they can offer a number of services besides ancestry testing.